Photo: (from left) Janet Evans, VP Trust Officer with Integrity First Bank; George Truell, president of the Mountain Home Lion's Club; and Carolyn Chentnik, Mountain Home Lion's Club membership co-chair. 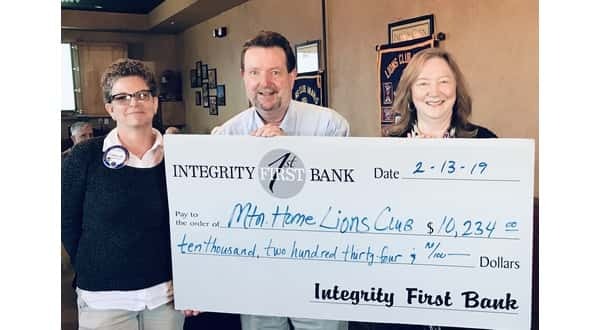 The Mountain Home Lion's Club has received a check for $10,234 from Integrity First Bank's Trust and Wealth Management Services on behalf of the Adeline Dvorak Trust. Lion's Club International is the largest and oldest civic organization the world and provides sight care and hearing related services its local chapters. For more information about the Mountain Home Lions Club, visit mountainhomelions.org.